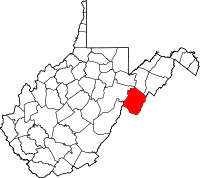 Dated from 1917 to the present, Pendleton County birth, death, and marriage records are available only to qualified people from the West Virginia Health Statistics Center, generally for $12. Public records ordinarily include birth records older than 100 years and death and marriage records older than 50 years. Records dated before 1917 and all divorce records are maintained by the Pendleton County Clerk. Pendleton County, created in 1787 from Augusta, Harding, and Rockingham Counties, Virginia, was named for Judge Edmund Pendleton, President of the Virginia Convention that ratified the Constitution. The first Europeans to explore and acquire land in this area were Dutch.